Naomi gets Ruth and Boaz together. The perilous economic position of women? Not sure what to do with this reading; some songs suggested for the Psalm or the Mark reading will work. WCC website Hear the message we now are proclaiming / El mensaje que hoy proclamamos (Eleazar Torregosa) This jubilant Colombian song of liberty and new life for the poor would fit well with this reading. Good for kids. Free sheet music! Our work is in vain unless God is part of it. It's good to have kids. Especially sons, apparently. A whole quiver full, too. Emergent Psalter Unless God builds a house (Isaac Everett) An excellent refrain for this Psalm. Just love the chords for it too... Sheet music (refrain only). Unknown Source True: Unless God Builds the House (Linnea Good) A very simple version of only the first verse. Available from Linnea's PsalmBody's Praying list. *ATAR675 / Iona (One is the Body) Keep me, Lord (John Bell) A new older style hymn. Good, thoughtful words. Straightforward tune; lovely harmonies if you have part-singers. Sound sample. *Taizé / TiS 739 / AoV2-041 / ATOK 404 / VU290 / GA269 / SFFS 2054 / GtG820 / G(II)451 / GC639 / GC(II)626 / G(3)733 / CP568 / W&R421 / URW388 / Lau947 Nothing Can Trouble / Nada te turbe (Jacques Berthier) Excellent and quite well known Taizé chant. Spanish lyrics are not too hard for non-Spanish speakers. Sheet music, sound samples, lyrics and translations. Good for kids. PH238 Unless the Lord the House Shall Build (Freeman Lewis) A fairly formal paraphrase, inclusive, and doesn't say that only sons are a blessing! Lyrics and sound sample. Elijah and the poor widow. God provides if we listen to God’s messenger. Hospitality. The resuscitation of the widow's son (if you continue the reading). Seeds of Faith Always Enough (Richard Bruxvoort-Colligan) A cool and bluesy song that tells the story. This is not a congregational song, but could be sung by your musicians, or if you are a musical Sunday school teacher, you could use this to tell the story. Lyrics and sound sample. Tune In / Online Resource You in all our worries / All will finish well (Dave Brown) “In this world where injustice reigns, you are in the midst of pain”. Excellent words of reassurance in a difficult world. Sound sample, lyrics and downloadable songbook. Tune In / Online Resource Community (Dave Brown) A song about being welcomed and part of a community. Sound sample, lyrics and downloadable songbook. "a glass of water shared with the thirsty". Good for kids. CH763 / MV193 God bless to us our bread (Traditional Argentinian) A lovely simple grace for meals and for communion. More Voices has Spanish and French lyrics as well as English. "God bless to us our bread, and give bread to all those who are hungry, and hunger for justice to those who are fed. God bless to us our bread". This would be very appropriate if you are celebrating communion this week. Good for kids. Sound sample. Online Resource Hear the message we now are proclaiming / El mensaje que hoy proclamamos (Eleazar Torregosa) This jubilant Colombian song of liberty and new life for the poor and suffering would fit well with this reading. Good for kids. Free sheet music! Christ appears in the presence of God on our behalf. Once only. *TiS 217 / AHB 148 / NCH43 / CH519 / UMH384 / VU333 / A&M721 / LBW315 / ELW631 / A&M721 / GA463 / HPP48 / GtG366 / PH376 / GC622 / GC(II)613 / G(3)641 / CP485/6 / CP(E) 516 / W&R358 / Cha517 / Srce457 / URW100 / 82Hml-657 / Lau801 / StF503 / MP449 Love divine all loves excelling (Charles Wesley) Can't possibly sing this song too often! 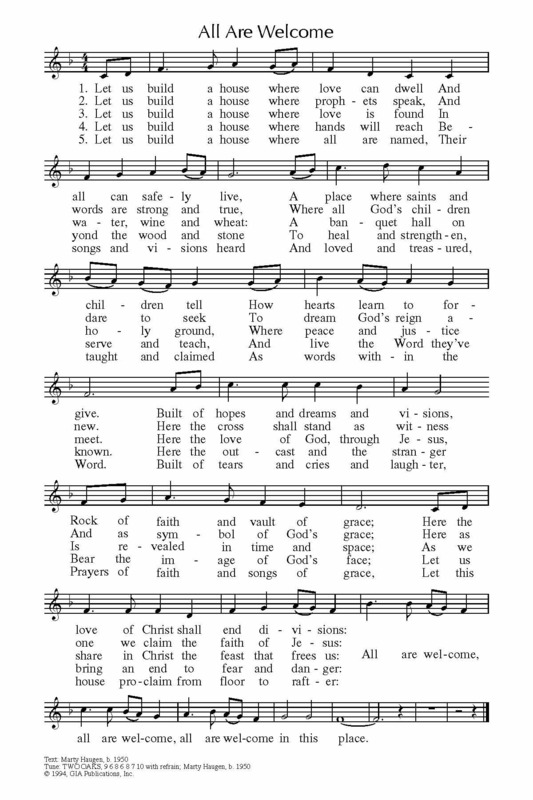 A beautiful classic song and most hymnals use a very inclusive version of this hymn, even the AHB! "Joy of heaven" *sigh*, so lovely! Lyrics and sheet music. You may also like to give Rend Collective Experiment's version a listen (hard to sing, but nice for listening). The scribes exploit the widows. The poor widow puts in her few coins. She has given all she has. *MV127 I saw the rich ones (Pat Mayberry) This is simple to sing and a great song for kids “The men in the vineyards were grumbling one day, I knew they weren’t happy with what they’d been paid… But with God the world is turned upside down. The poor are embraced and the lost they are found. Let’s work for a world where all people are free. Where it’s good to feel good about God loving you and me”. Good for kids. GtB / On the Road God is love and love is giving (Ross Langmead) A simple kids' song about God's love. A round. Sound sample. Good for kids. TiS 599 / AHB 520 / NCH448 / CH502 / UMH399 / VU506 / LBW406 / ELW685 / A&M787 / HPP349 / GtG697 / PH391 / CP435 / CP(E) 581 / W&R466 / Cha609 / Srce633 / 82Hml-707 / Lau874 / StF566 / MP624 Take my life and let it be (Frances Havergal) An oldy but a goody. Lyrics and tune sample. Oldy-but-a-goody. *AoV2-065 Returning Our Gifts to the giver of life (Phil Porter / Elaine Kirkland) Good as an offering song. Sound sample. TiS 774 / W&R684 For the life that you have given (Carl Daw) A nice short song for the receipt of the offering.